On December 10, 2015, British veteran Jewish writer, actor and director Stevphen Berkoff, penned an Op-Ed for Israel’s top British Hasbara organ, Jewish Chronicle, saying: Why is there such an important need to step into the place where once the Jewish temples stood? It has gone, gone, over 2,000 years ago. Get over it! How could it be? When the Temple was destroyed, no stone was left unturned. Posted to Facebook. Love your informative articles. Thank you. I read it was part of a stable’s wall from a Roman Fortress… anyway, never let the truth get in the way of a good scam. Reblogged this on Anno Domini 2016 / News. The entire neoZionist Jewish claim for Palestine, as predicated on the Biblical imperative, is nonsense. God is not a real estate agent in the heavens. I live in London. If a bunch of Italians attempted to steal my land and home based on the fact that in some point in ancient history the Romans had settled in Londoninium, I would defend with all my life to protect my family from the invaders. The same principle applies to the Palestinian defence of their territory.. If the Arabs were there first, why is the Al Aqsa mosque built on top of the Temple Mount instead of the other way around? Did you bother to read various Judo-Christian sources I mentioned in the post Moshe? The whole article debunks that slavic myth halfwit. That wall was part of a Roman fortress. Poor Arabs with 22 countries. Poor Jews who were thrown out of Europe 108 times for being a cancer to the Christian world. Did we need UNESCO to tell us that? The irony is that for 1800 years “the Wailing Wall” was the focus of any Jewish pilgrimage to the Holy Land. Attested to in Islamic history books as a Jewish pilgrimage site! As the only wall of Jerusalem remaining it represented for diaspora Jews the destruction of Jerusalem and validated the second exile as divine intervention in history, where Jews were obliged not to migrate from Exile to the Land of Israel en masse and not to rebel against the other nations, and the other nations were obliged not to subjugate the Jews excessively. Yet now the Zionists’ claim the establishment of the State of Israel put an end to Exile and cancels the three oaths, so for them this wall is no longer “the Wailing Wall”! Correction dear. According to Israeli historian Dr. Shlomo Sand, the ‘Jewish people’ were coined a little over a century ago. The Hebrew people used to perform pilgrimage to the Solomon Temple and not the Wailing Wall. There is no historic proof that Jesus ever visited the Temple or cried in front of The Wall. Muslim Caliph Umar ibn Khattab who took control of Jerusalem city in 637 cleared the site now known as ‘Al-Aqsa Mosque Complex’, considering it the ruins of prophet Solomon’s grand mosque from where the Prophet Muhammad (pbuh) ascended to Heaven. The area was used as city garbage dump by the Christian rulers of the city. As a policy, I deleted your link to Israeli propaganda site, Wikipedia. It doesn’t make half the assertions the author is claiming it does. It makes no statements, for or against, the historical authenticity of the Wailing Wall. 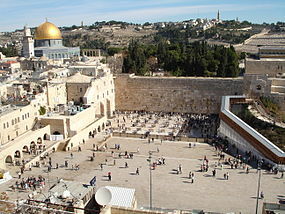 It makes no statements, for or against, any connection between Al-Aqsa and the legendary Temple of Solomon. It does reference the state of Israel as “the Occupying Power” within the context of Jerusalem, which in an unimplemented UN plan from the 60’s was supposed to be a neutral UN-administered city. It makes no statements regarding fake graves, or graveyards at all. It does criticize “security” actions which have restricted Muslim access to their holy sites. The majority of the other criticisms are directed at construction and development. I call upon the author to cite the passages that support his assertions. You would find answer to your questions, here. The Ruins of Solomon’s Temple are still to be seen – in Luxor, Egypt. Solomon was the Pharaoh Ymn Htp III and there is not the slightest doubt about this. Stacks of solid proof – not just evidence. Even his name is the same since Htp was Egyptian for Salim, thus Salim Amen. No darling – his name was (is) in Arabic سليمان Suleymān. Salim, meaning “safe” is a common boy name in both Persian and Urdu speaking Muslims and Christians in Pakistan, India and Afghanistan. In Turkish language it’s written as “Selim”, like Ottoman Sultan Selim II, son of Ottoman Sultan Suleyman the Magnificent. Who cares what the Unesco and UN and their dirty globalists say. Israel is not going anywhere, get used to it. What a Zionist idiot, eh! Don’t you know the “dirty globalists” are your messianic Jewish brother and sisters?